Some recent events... why not. Friday, Wes and I went to World markey, Elderly Music, and Marshall Music. Lots of cools tuff at all three. I bought some nice chopsticks at World Market. Musical instruments interest me but I have no musical talent. I can't even play DDR Ultramix on training mode with easy settings with a controller on my XBox. :D I never got past my Yamaha Recorder in early 6th grade. :D But yeah, it'd be cool to be able to play something besides whistling or a kazoo. So yeah, spent most of the afternoon looking around all those places. Also bought Lindy Dark Chocolate Truffles at World Market... mmm. Friday, mom had taken the day off work. And she ended up winning a gift certificate to the River's Bend Mesquite Grill near here from a radio station. It's a nice restarant, and her and dad went out to eat that night. Saturday was their 28th wedding anniversary also. We all were over there Saturday night... Mom, Dad, Myself, Nicole, her bf Matt, his son Austin, Nate, Aunt Susan, Uncle Richard, and my cousin Rachel... we had a giant fish fry... dad had been spending most of the evening last week out ont he ice and had great fishing. So yeah, fish fry, fried potatos, cornbread, homemade cole slaw, baked beans, etc. Played the game Catch Phrase for a while. Then for dessert, mom had made both an apple crisp, as well as a chocolate pudding/banana cream pie. Was great. I was over there from like 6:30 to a little after 1AM I think. Good fun though. Then after I got home, had to clean the house. There was a showing at 11AM Sunday. So I went back to the lake for the afternoon... watched some stuff on Arnold on A&E I think... and then flipped over and watched two hours of MythBusters. Came home, and slept the entire afternoon through to 3-4AM... missed the entire Superbowl, commercials included... darn. Still in need of a job. Been doing several freelance tech support/pc repair jobs lately. Which is resulting in me getting sick of tech support again. :P Viruses, rogue startup apps, trojans, spyware, adware, blown power supplies, fried modems, etc. One computer has been here at the house since before x-mas... they're supposed to be buying a new PSU themselves, and bring it over, but haven't heard from them. My car was fixed and is back to me. It's still a POS like it was years ago. And sitting for a year and half didn't help it. But eh. It's transportation. And even before when it was a POS, it made it to Atlanta and back numerous times, so it can't be too bad. I'd say 80% of our snow has melted this weekend and this week so far. I really want spring to hurry up so I can use my new bike. 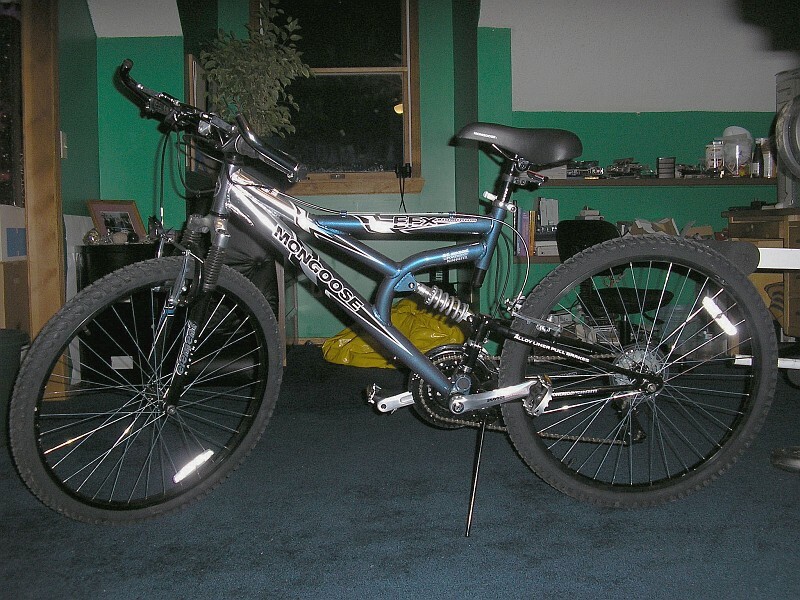 Which isn't the Trek I wanted, but my parents bought it for me, and it's better than no bike, and should work out fine. Not sure how easily I can get used to full suspension though. Will see. And I'm already running out of crap to say even though more has happened. Maybe later. I am completely addicted to DDR. I LOVE it. And I can't wait until the snow melts either, for the same reason. J gave me a bike for Christmas, well, a coupon for a bike, and I can't wait to go and buy it! I haven't talked to you in forever! I just decided to give this thing a shot again and wanted to say hi. I went to Animania last month after a very long hiatius, I think you were there the last time I went. I saw you made mention of possibly attending a couple months ago. I am pretty sure I will be attending regularly again (with the exception of this weekend). Let me know if you ever venture out this way for Animania.